Thank you for your interest in volunteering in our community! When we come together to support one another, build something, improve something, preserve something, we find something special — we find a purpose. Check out our current volunteer needs below. There are all kinds of ways you can get involved today. Each year, hundreds of volunteers rally together to get the city ready for summer. City-hosted projects include trail and pathway maintenance, tree plantings, park beautification, creek cleanups and more. City staff and volunteer captains will provide volunteers with materials and instructions to make the day productive and fun. It is a great, family-friendly way to give back while mingling with other Boulderites. WANT TO COORDINATE YOUR OWN CLEANUP PROJECT? We invite you to gather your neighbors and bring Community Cleanup into your own neighborhood. Design and implement the project that will make the most impact. City of Boulder’s Neighborhood Services will support you with latex gloves, trash-bags and some snacks for your crew. And we’ll reimburse up to $300 of project expenses. 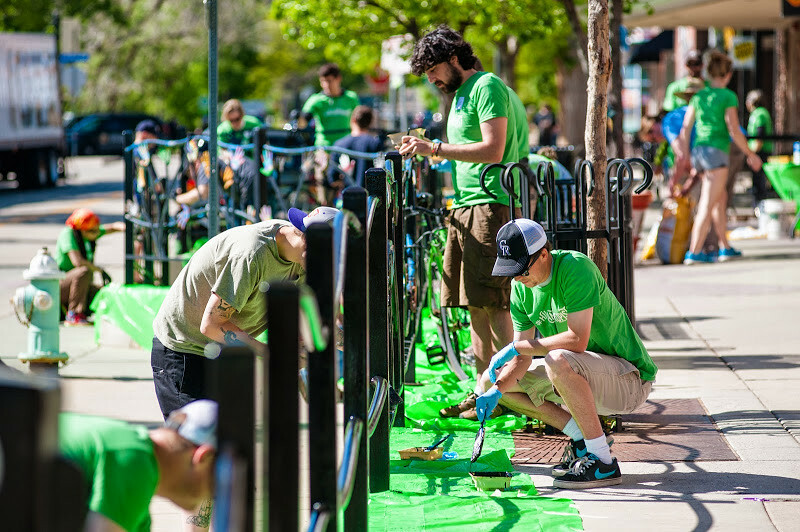 Visit Count Me In Boulder, the one-stop solution for all volunteer projects, to be a part of the volunteer team at one of the city-hosted or neighborhood projects. Visit the calendar to explore all of the projects available during Community Cleanup in May. Click on the Register Now button below. Move the calendar to April to see the opportunities in sage green. The city recently launched Count Me In Boulder — a one-stop solution for citywide volunteer coordination and event management. The cloud-based system will save staff members, volunteers and patrons time and energy with intuitive features like automated hour tracking, self-reported site visits with impact-related measures, eLearning, activity registration, highly customizable reporting, world class training and support, and more. Click on the tab below and take a minute to sign up and get started — all that's needed is your name and email address. In recognition of National Volunteer Appreciation Week, which is April 7-13, and as a small token of our thanks to you, we are offering a variety of community tours for each city volunteer and family members or friends. This includes tours of several city facilities, such as the Wastewater Treatment Facility and libraries, police and fire stations, as well as talks from some of our experts, and much more. Volunteers can register for as many events as are available, and all are encouraged to bring a friend or family member. Click the tab below to browse all the available events and activities ... and be sure to sign up today! Bat monitors head out at dusk to ponds and bat roost sites, performing auditory and visual bat population counts May through September. Information gathered aids resource conservation decisions. View the bat monitor program description and application. Volunteer Host at an event. Volunteer Outreach Hosts support visitor services and coordination of family nature events. Depending on assignment, volunteer hosts may greet and assist visitors at the Chautauqua Ranger Cottage, provide information on OSMP resources and destinations, observe and report visitor issues and inquiries, support staffing of events such as Nature Play and story-book hikes, assist with event logistics (set-up/clean-up) and general guest coordination. View the program description and application. The Public Works Department is looking for community members and organizations to adopt an area in the city to keep free of debris. This program provides an opportunity for groups of any size and of varying ages to regularly volunteer and set their own schedule. Apply to adopt a specific median, multi-use path, road, bus stop or pocket park for a period of one year. Click to view a map of available areas, medians and pocket parks that can be adopted today. Learn more about this program and join in the fun! Volunteers appointed to serve on a board or commission help City Council examine issues and, in turn, shape the future of Boulder. Applications to serve on advisory boards are open in January and February each year. Learn more about boards and commissions. From advocating for victims to assisting detectives, Boulder Police Department has a variety of volunteer opportunities at any given time. Volunteers help police be their best. Please note, recruitment for victim's advocates occurs in January and March each year. Learn more volunteering with Boulder Police Department. Library volunteers contribute more than 20,000 hours of valuable service annually. Volunteer opportunities are available at the Main library in addition to the four branches, offering positions for adults and teens. We have a variety of placement areas to choose from, and our programs can utilize a diversity of interests, skills and schedule. The word "Hillanthropy" reflects a primary goal of the city’s Hill Reinvestment Strategy – to reposition University Hill as a Boulder neighborhood to bet on, one that’s on the move, steadily recapturing its vibrancy and vitality. Volunteers can help beautify the neighborhood and get involved with other projects. Learn more about volunteering on The Hill. The Energy Strategy and Electric Utility Development team performs work related to forming a locally owned utility and developing future energy strategies. The team has formed volunteer community working groups to obtain input from residents, businesses and stakeholders on project focus areas. Learn more about volunteering with Energy Future. Open Space and Mountain Parks (OSMP) Volunteer Services provides a variety of programs, projects, and events to community members and organizations year-round. Learn how you can give back to the land in meaningful ways. Learn more about volunteering with OSMP. Volunteers are an integral element to the Parks and Recreation Department. People of all ages help contribute to varied projects at facilities, parks and natural areas throughout Boulder. Learn more about volunteering with Parks and Recreation. Community members and organizations to adopt an area in the city to keep debris-free. This Public Works Department program provides an opportunity for groups of any size to regularly volunteer and set their own schedule. Apply to adopt a specific median, multi-use path, road, bus stop or pocket park for a period of one year. Learn more about adopting an area. Senior Services has multiple opportunities for Boulder residents to give back to our vibrant older adult community. Opportunities include fostering engagement and the well-being of older adults, making our centers even more friendly and inclusive and serving on the Senior Community Advisory Committee. Learn more about volunteering with Senior Services. Thanks to the Boulder community, the Volunteer Cooperative is helping the city become more resilient in the face of future challenges and continuing to highlight the city’s spirit. Take a moment to review our Strategic Plan and Annual Report to get a better sense of our current and future plans. And take a moment to check out the Volunteer Cooperative Handbook, where you will find all the information you need. We are pleased to announce that Boulder's Volunteer Cooperative has been certified by Points of Light as a Service Enterprise! A Service Enterprise is an organization that fundamentally leverages volunteers and their skills throughout their organization to successfully deliver on its social mission. To earn this honor, Volunteer Cooperative staff completed an extensive assessment, over 20 hours of training and consulting, extensive internal planning and change to better integrate volunteers in our day-to-day operations. By achieving this level of excellence and certification, the Volunteer Cooperative is now better equipped to leverage the time and talent of volunteers and better meet our mission. Do you have a particular skillset or area of interest but you don't see mention of it here? We want to hear from you. For more information on how you can get involved, contact Aimee Kane, volunteer program and project manager, at 303-441-4235 or [email protected] . "Volunteering on behalf of the City of Boulder's various organizations is inspirational, educational and rewarding. Boulder is an amazing community and I am motivated to enhance the activities of these organizations." The City of Boulder’s Volunteer Cooperative is composed of volunteer coordinators and staff from all city departments who work with community volunteers. We work together to enhance community engagement, increase collaboration and ensure the highest quality volunteer experience possible. Our mission is to support a community of service. Our vision is an integrated network of resources and opportunities to strengthen community stewardship.